← Giveaway … a few supplies for the holidays! Thanksgiving is over, but pumpkin season continues … at least at my house! I have not had a piece of real pumpkin pie yet … this is my pumpkin pie substitute … Ooey Gooey Pumpkin Cake! It’s what I describe as pumpkin pie with a cake/cookie crust … and wonderful. The cake makes me happy 🙂 It will make you happy too! This is a nice “portable” dessert that can easily be taken anywhere … leave it in the pan and go! Preheat oven to 350°F. Lightly grease a 9″ x 13″ baking pan. Make the cake/crust – Combine the cake mix, egg, melted butter and mix well with an electric mixer. Pat the mixture into the bottom of prepared pan. Make the filling – In a large bowl. beat the cream cheese and pumpkin until smooth. Add the eggs, vanilla, butter and beat together. Add the powdered sugar, pumpkin pie spice and mix well. Spread the pumpkin mixture over the cake layer. Bake for 40-50 minutes. Be careful not to overbake as the center should be a little gooey. Cool completely and serve with whipped cream and sprinkle a little pumpkin pie spice on top, if desired. Serves 12-15. 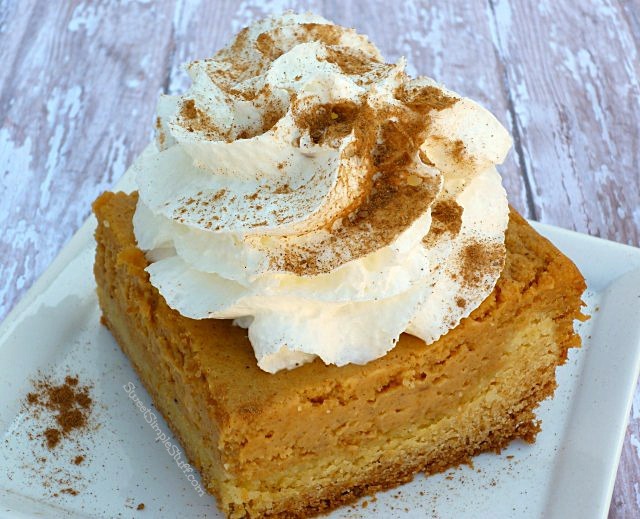 Yummm can’t wait to try this…anything I can leave in the pan is a plus for me..Well lets just say, there will be HOPE for my boys to finally get a pumpkin dessert..
Leaving it in the pan is definitely a plus 🙂 I HOPE the boys enjoy it! Oooh, this looks SO good! This sounds so good. I think I’m going to try this. Sounds easy and that’s for me. Delicious, Brenda. I’m thinking of sandwiching some vanilla ice cream between the pie/cake and the whipped topping. I want to jump into your blog and eat that piece of cake!!! Where can I find the red as well as blue and white sticks that are in your give away? My hubby also isn’t much of a pie crust person, so I know he will certainly love this. Oooooh, I love Ooey Gooey:) Can’t wait to make this one! I just made this and it was a mess but it came out really good and everybody loved it. I would make it again.